I'm very pleased to share that Southwestern Heroine has won a merit award! 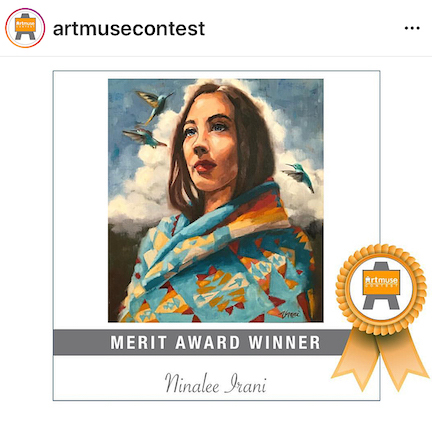 Thank you to Art Muse Contest for this honor! If we can decipher whether or not a community is happy based on the lifestyle of its pets, then the chickens on Bainbridge Island indicate that its citizens are content beyond measure. Chickens live cushy lives on this little island that I adore, which has one bridge, a few wineries, about 24,000 people and coffee sent from heaven at Hitchcock Deli. Many of the feathered friends live in custom built coops designed to resemble their owners' home, some complete with a small chandelier and a couple of pieces of artwork to adorn the walls. I have witnessed them being fed the Dungeness crab that didn't get finished at dinner, and free-range has a new meaning when you see two fluffy, caramel-colored hens strolling along the sidewalk towards the park near a local grocery store. Chilly in the evening? Chicken sweaters. Automatic chicken coop doors? They exist. This is the life of a Royal Hen, and why not? Caring for another living thing so kindheartedly is rewarding, and in this case a reflection on how members of this community care for one another. Just have to give a shout-out to Good Egg on Bainbridge Island for a spirited Instagram post full of praise for the Royal Hen! Thank you! In the fall and spring, I teach a six-week painting course at Winslow Art Center on Bainbridge Island. My next session will be starting soon on October 18th, so if you have always wanted to learn how to paint in oils or acrylics but aren't sure how to start, let me show you how in this foundations course. The environment is positive and relaxed, and you'll leave the class with a clear understanding of how to create your next masterpiece! Click here to be directed to the Art Center's website. I spent about an hour at Pike Place Market yesterday looking for flowers for new still life pieces, and made a definite spectacle of myself on the ferry ride home trying to keep too many bouquets and bunches upright. There had to be thousands of daffodils and tulips, cherry blossoms and hyacinth to choose from - it's impossible not to leave there happy! Some people write journal entries; I keep a recipe book... paint recipes. This comes in very handy when I need color inspiration, or when I'm working on a larger piece and need to remember how to mix a certain color. I'd love to be able to write that these formulas just stay in my head, but that rarely happens! Lately I’ve been painting playful landscapes in heightened colors that are designed to help the viewer feel like they are in an environment completely void of anything serious. Stepping into these scenes erases all responsibilities to bills, schedules, emails, and people duties. The brush strokes are largely unblended and the fine details have been omitted to give the eye a break. We have enough figuring out to do – my hope is that everyone who takes the time to stare will leave the painting feeling light-hearted. However, not every day is a bright, primary palette, and yesterday I decided to do a raw umber experiment. Raw Umber, cool brown, or blah brown – they all mean the same thing and are a perfect way to dull the brilliance of any color you’ve mixed. In this palette raw umber is the base for each color and I chose a simple reference image for the color study. This photo was taken in California on the freeway to Monterey out the window of a moving twelve person van that included four kids. No, I wasn’t driving:) I’ve included the picture here. It’s really amazing what paint can do to change a scene. The result is a quieter, less bossy painting, and I'll definitely use this palette on a larger piece. The birds in this 12 x 12" piece are grittier than the ones I usually paint. They could have just stumbled out of the pub. 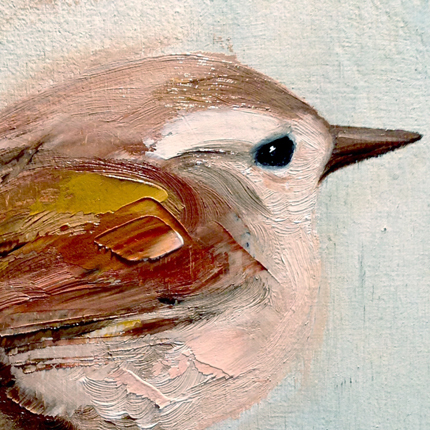 To achieve the look of an unpampered bird, I blended less, added more thick layers with a palette knife, and kept the brilliance of the colors to a minimum. The photo I've shown here is a detail shot of the listening end of the duo. In other news, I will have a few of my pieces in Clawhammer Letterpress and Gallery in Fernie B.C. very soon. Visit their website by clicking here. You'll love the feel of the place when you walk in - it's casual, creative, and welcoming. I'm very honored to be included in the July issue of FreshPaintMagazine! I decided to name this piece "Gathering the Courage to Ask", but it was originally going to be, "I'll Think About It" and I went for the kinder option. Most of my birds look very whimsical, like they are painted quickly, but you'd be surprised at how long I take to complete one. I try to consider each stroke of my brush but am less careful with the palette knife. One time I posted a video of a bird in progress on Instagram and I removed it within a day because it bothered me that it looked so rushed - it wasn't a true representation of how I paint. The video turned out that way because of the pressure to fit as much information as possible into that short, timed clip. So I was hurrying and won't post a video again unless I feel viewers would like to see three brushstrokes and a bristle-dip in some linseed oil! Pier One Imports has printed "It's All About Balance" in a very unique way! They turned it into a 30 x 40 inch piece that can be hung indoors or outdoors :) Click here to take a look! Over the holidays I managed to work on three small still life pieces, in between playing hostess, laundry lady, and Santa's personal assistant. My son still believes in the big guy, who somehow gets through the pane of glass on our fireplace every year. The lies we tell!! He's catching on, though, and I'm sure that this will be the year that the older kids at school break the news to him and he comes to us for confirmation. Once these paintings are set I'll go in and tweak areas with dry-brush strokes. Until then it's back to work on a winter series of birds for Sagebrush Fine Art. I'll never tire of painting these adorable creatures! Happy New year! This is a head shot of my most recent subject. He's bold, wise, and a little stubborn. If you're on Instagram, you can follow me at Nineart, and if you enjoy perusing through images of birds, you'll want to follow Adam Goldberg at ajcgoldberg. He's amazing at catching them in action! I recently signed with Sagebrush Fine Art Publishing, and they have been really wonderful about promoting my birds! art and design show in New York in May. Prints and mock-ups for potential licencing will be included in this show. The composition of this piece chose the title. Their branches will be the same color once the dust settles. Exciting news pour moi - my piece titled "Salad" was chosen for exhibition by Linus Gallery in Pasadena, California. It will be a part of the Slice of Life show on April 26th under the category of Fork & Knife, so if you happen to be in Pasadena on that day, say hi to "Salad" for me, and enjoy the event! Many beautiful and creative paintings will be displayed, so I feel very grateful to be included in a show beside that kind of talent.